You’ve said that you’re both pro-Palestine and pro-Israel. How does that work? Rabbi Michael Lerner: Tikkun has always believed that both Israelis and Palestinians have suffered deeply and this is the guiding reason behind the conflict in the Middle East. We do not support the Occupation of Palestine, nor many of the Israeli government’s policies – including officially naming Israel as a Jewish state. We at Tikkun have argued for a humane and empathic solution that recognizes the mutual suffering of both sides and seeks to end that suffering. One way would be for Israel to generously and whole-heartedly apologize for its part in creating the Palestinian refugee crisis (not total responsibility, but some for sure) and then help create an economically politically viable Palestinian state in the West Bank that might eventually form a kind of common market with Israel and Jordan. Another way would be for Israel to become a democratic country by giving Palestinians in the West Bank full citizenship with no discrimination, and adopt a Constitution that would require that the government of this democratic state always be open to Jews anywhere in the world who wanted to return to their ancient homeland and similarly accept Palestinians who wanted to return to their homeland, in each case providing equal financial support and assistance in resettling in this new democratic state of Israel/Palestine. Israel currently operates from a position of extreme power as it is one of the best-armed states in the world and is frequently backed up by its number one ally, the United States, while Palestine has few allies and even fewer resources. So the major steps must be taken by Israel in a spirit of reconciliation—but Palestinians must respond in kind, though understandably both sides are going to need a lot of therapy for several decades to rid themselves of the hatred that has been generated by the history of each side resorting to violence against the other, no matter how unequal the impact of that violence has been. Ultimately, Israel can only be a Jewish state if it espouses Jewish values – those of justice, peace, loving the stranger, and kindness – and right now, it does not. Some have called Tikkun anti-Semitic for its criticism of Israel. We believe that we are in fact embodying Jewish values, not acting against them, by calling for Israel to be a more loving, kind, and empathic neighbor to Palestine. This is the only approach that can ensure the longevity of Judaism as a whole. Otherwise, as the Occupation continues into the future, more and more of the people of the world are turning against Israel—people who have nothing in their religions or belief systems that would otherwise have turned them against the Jewish people. For the safety of Jews, Israel must become an embodiment of generosity and caring—that is the only path to ensure its security and to ensure the safety of the Jewish people around the world. This is a very short statement that does not reflect the nuances and complexity of our position, which you can only really get by reading my book, Embracing Israel/Palestine, which you can obtain here. I’ve read over the Global Marshall Plan, and I don’t get it - why should we Americans have to pay for overseas development in countries when we won’t get anything from it? You claim that this is a strategy for Homeland Security? Shouldn’t that money just go to the military? Rabbi Michael Lerner: In the United States, we believe that putting money into the military will make our nation more safe, in other words, violence = security. But actually the history of the world shows that violence produces violence. The Global Marshall Plan sees a different kind of world, a world where generosity will guarantee the safety of all: in essence, generosity = security. We saw, in the United States’ invasion of Iraq and Afghanistan after 9/11, that violence only creates more violence. Increased military spending isn’t keeping us safe. We are the richest country in the world. We could easily afford to end global poverty, hunger, homelessness, inadequate education and inadequate health care, and do it in a way that was environmentally sustainable. Doing so would have an immediate impact in undermining the appeal of extremist groups and terrorists, and increase the desire of people all around the world to believe that their own well-being could better be achieved through generosity and caring rather than in violence and hurting others. Our plan is not one that calls on the U.S. to be the only contributor, but only the first to initiate the Global Marshall Plan. Others rich countries will join us. In the meantime, China has started their own plan to spend over a trillion dollars in helping other countries. Yet there is some reason to be concerned since China may be seeking to become the next most powerful country, rather than the most generous. We should be seeking to work in partnership with China and all the other wealthy countries of the world so that instead of people fearing us, they see us as their allies. This is a much smarter way to protect ourselves than another period of escalating tensions and arms races to see who can be the most powerful. Instead, we should be initiating a different kind of race to see which countries can be the most generous and caring for others, because that is the only way we will actually win friends and allies in the long run, and the only way we can actually embody the highest spiritual and ethical values in which most Americans believe. Why do you think that the Global Marshall Plan is the best way to stem immigration that has been overwhelming the advanced industrial countries of Europe and that generates fear among many Americans? Rabbi Lerner responds: We must ask ourselves: why would any reasonable person want to flee their homeland, their family, their community, all they’ve ever known, to come to the United States, where xenophobia and racism run rampant and there is a president who actively despises immigration? The answer: they are fleeing violence, ethnic cleansing, poverty, deprivation, and illness. Instead of pouring money into military spending to combat terrorism overseas, Tikkun believes that we should funnel 1-2% of our GDP into overseas development – the largest and most comprehensive development spending the world has ever seen. If we can make home countries safe and prosperous, we will see decreased immigration as well as decreased levels of violence and will actually make the United States, and the world, a better place to live. We all benefit from a world where all people are happy and prosperous. Please see the text of the Global Marshall Plan, currently before Congress, here. I’ve read a lot in Tikkun about how capitalism is morally bankrupt, but I don’t see another alternative. If we don’t have capitalism, what will we have? Rabbi Michael Lerner: Contrary to popular belief, capitalism is a relatively new human construction, with roots in the ancient and Middle Ages, developing its worldview most fully from 1500-1800, but only fully emerging during the first Industrial Revolution in the 1800s. As capitalism developed, it began to shape the morals and ethos of working people. They began to believe in what we at Tikkun call the myth of the meritocracy – that with hard work and dedication, anybody can rise up in social and economic status and create a new life for themselves. But the truth is that capitalism is based on huge inequalities of wealth and income, and only a small percentage of the population can be part of that under the capitalist system—so most people find that even with endless hard work that they are barely making it financially. Yet when they allow themselves to challenge this system they get told that this is their own fault, that they were not smart enough or didn’t work hard enough. This is a lie, but when repeated often enough becomes the lie that most people believe is true. This made those who could not “succeed” materially feel worthless, unintelligent, and frustrated. 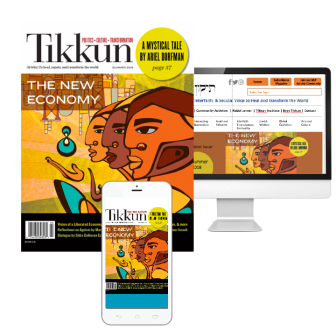 At Tikkun, we champion an alternative view – that the capitalist system is inherently rigged, that it is at its core a system of selfishness and materialism, and that the consequence, in at least half or more of the population, is to make people feel hopeless, powerless and self-blaming. Tikkun wants to challenge this worldview and decrease self-blaming by helping people understand that it’s not your fault – it’s the fault of a system that will always be unequal and benefiting those who won “the birth lottery”—namely being born into families that gave them the opportunities, the education, and the self-confidence to participate more successfully in the struggle of all against all that is the reality of the capitalist marketplace. Yet although the upper 20% of income earners and wealth holders have won economically, they are frequently not happy because to “make it” they’ve had to leave others behind, participate in a system that is actually unfair and which they have to lie to themselves in order to ignore its unfairness, and to adopt ideas that are elitist and hurtful to others. Most people actually have a yearning for a higher purpose to their lives than making money, and that is why so many people who do succeed economically are often frustrated, depressed, alienated, and lonely. We propose a new line of thinking, called the New Bottom Line, which will replace the Old Bottom Line based on money and power with a new system based in love and generosity. Our visionary strategies include redistributing wealth so that everyone starts on a level playing field, and shifting our values away from money and power-centric towards love, caring, and generosity. The New Bottom Line is this: let every government and economic policy, every corporation, our political system, our judicial system, our educational system, our cultural system be judged “efficient, rational and productive” not to the extent that they maximize money or power (the Old Bottom Line) but to the extent that maximize our human capacities to be loving and generous, compassionate and empathic, ethical and acting in environmentally sustainable ways that protect the earth, seeking social and economic justice for all, treating other human beings as embodiments of the sacred rather than solely as vehicles to satisfy our own needs and desires, and responding to the earth and the universe not as though it was there solely to provide consumer goodies for humanity but rather with awe, wonder and radical amazement at the grandeur and mystery of all being. This is what we mean by a spiritual politics—it doesn’t require believing in God or any other religious belief, but it does require giving up the capitalist notion that everything we can know or value must be measurable or inter-subjectively verifiable (the extreme empiricist worldview that developed along with capitalism and gives it its claim to being rational). With proper values education, we can change the United States from the land of the individual to what we call “the Caring Society—Caring for Each Other and Caring for the Earth.” It’s not government that can do this, though it has a role to play, but it is the new ethos that we seek to develop and which touches the deepest yearning of our souls—to be loving and caring for each other and to receive respect, dignity and love from others. As capitalism moves further and further towards its own demise, destroying the life support system of the planet in its pursuit of endless growth by exploiting the planet’s limited resources, a movement of people will emerge which demands fundamental transformation. All the social change movements will eventually realize that they cannot achieve their limited goals without a larger social transformation. 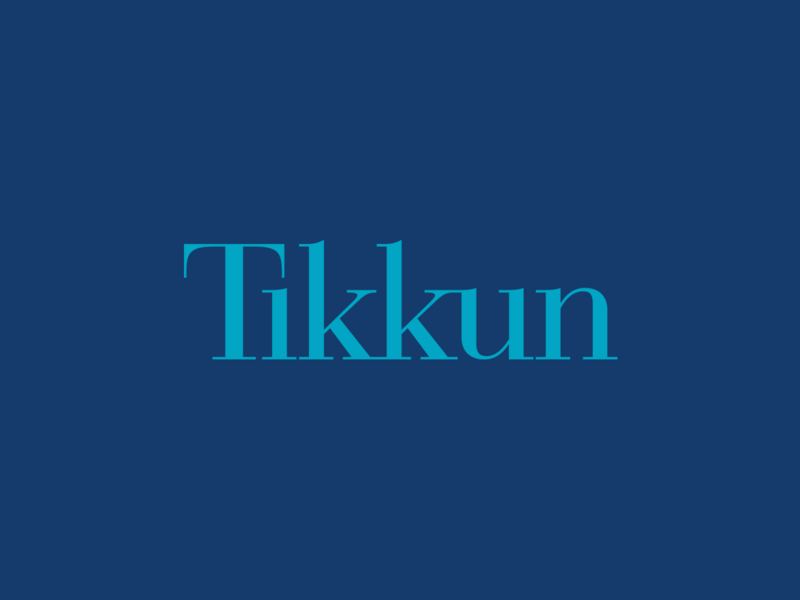 Tikkun and the Network of Spiritual Progressives are part of that process—we are an important consciousness transformation movement that is presenting a new way of being a social change agent and a new way of moving forward. Liberal and progressives need to not merely articulate what they are against but even more importantly, articulate a vision of the world that they actually want. We do that. A first step in that process is to popularize the Environmental and Social Responsibility Amendment to the Constitution (ESRA), the Global Marshall Plan, and the New Bottom Line. Our first goal is to get people to think outside the existing frameworks that have boxed them in, and to visualize the world that they would actually want to live in. I’m hoping that if you read and create a study group around my new book where I outline the path towards a new society, coming out in the Fall of 2019, called Revolutionary Love, you’ll find yourself being a bit liberated from the “reality” that presents itself as impossible to change and that is so hurtful to so many. Okay! You’ve convinced me. I want to get involved with Tikkun’s mission, but I don’t really have the time to start an NSP chapter or write an article. What are some small things I can do? Rabbi Michael Lerner: There are a lot of small ways to make a difference! Simply starting a conversation with someone who holds different views than you is a good place to start. When engaging with these people, remember to be empathetic, to listen, and always try to understand where the other person is coming from. The NSP offers Spiritual Activism Trainings, which run for 7 weeks with a Zoom meeting for about two hours each week. These trainings will help you learn empathic listening, how to make a difference in your community, or simply how to have more productive Thanksgiving dinner table conversations. You can also call, email, or mail your local representatives asking them to introduce or sponsor the GMP and the ESRA. For more activism ideas, please visit our Activism page [link to page].